Time flies ，It is already September’s peak season for orders . Are you ready for your food business ? if you want start your business before Christmas.. must start ready for the mall kiosk project now . as we know mall kiosk is very popular in United stated , UK , australia , france China etc .such as juice bar , ice cream kiosk , bubble tea kiosk . fruit kiosk , snack kiosk , crepe kiosk , candy kiosk etc . today i wanna introduce a creativity mango display kiosk for your meet . hope is helpful for your business . I have to say that the whole cabinet is very high-end and eye-catching. whole kiosk mainly tone is white and green , match a little brown solid wood, very modern and fashion . whole kiosk measure is 8ft length by 8ft width , basic material is fire retardant plywood . surface is laminate finished . 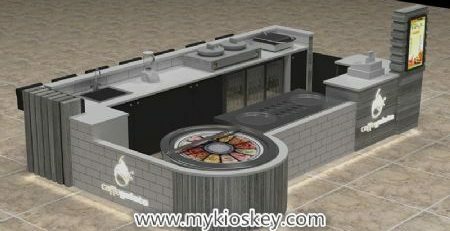 The layout of whole kiosk is very simple , front part mainly for order , with a small cashier counter . left sides with a four tank stainless steel sink .a enterance door and a stainless steel ice box . the back sides with a long counter with cabinet for storage, top part also can put some juice machine and milkshakes machine . right sides also with a counter , below is empty for put a beverages display fridge .whole counter hight is 900mm . with 300mm height glass retainer . you will notice the sink around is ground glass. You will notice theeach sides of this kiosk have a round shape 3d luminescence acrylic logo .Vivid and lifelike, It’s a great creative design, it’s very eye-catching .